Obituary – Diehm, Erma (Stockton) « Perry High School Alumni Association, Inc.
﻿Erma Diehm, 85, 604 Kaw street, died at 3 a.m. Monday at Perry Memorial hospital. Funeral will be at 2 p.m. Thursday, at the First Christian church. Rev. David Dickinson, pastor, will officiate. Burial will be at Grace Hill cemetery under direction of Brown Funeral home. 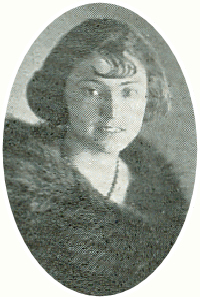 She was the daughter of Luther and Mary Belle Stockton and was born at Perry, Nov. 17, 1903. She and Martin Diehm were married at Perry, July 25, 1923. Mrs. Diehm was a member of the First Christian church of Perry and the Hunter extension homemakers group. She also was involved in activities of Perry Senior Citizens center. Among survivors are one son, Martin Ray Diehm, Red Rock ; three daughters, Anna Mae Ruuttila, Springfield, IL; Lois Elmore, Richardson, Texas; and Bonnie Frazier, Seattle, Wash.; one sister, Blanche Bruton, Neodesha, Kan.; nine grandchildren and nine great-grandchildren.